Although an unofficial slogan of Edmonton, we feel ‘the city of champions‘ is rightfully deserved. It’s one that resonates with us and the thousands of Edmontonians we’ve seen transform into true axe throwing champions at Bad Axe Throwing, the city’s premiere axe throwing venue. To put it more accurately, Trip Advisor rated us in the top 10 fun activities to do in Edmonton and that’s a designation we’re proud to hold in one of Canada’s top cities. It all started just over a year ago when we set our sights on bringing fun, laughs and good times across our great country. Edmonton was a logical target for a number of reasons, most notably for the fact that it’s a growing, thriving city that appeals to both urbanites and nature lovers. They’re the kind of people that enjoy a traditional fun night out mixed with something totally different. And axe throwing is an activity that delivers on all fronts. It provides a way to relieve stress, get active, experience an adrenaline rush and spend time with friends–all while developing your inner lumberjack or lumberjill. What makes it particularly unique is that for many, it’s completely outside of their comfort zone. Throwing steel blades at a target painted on a wooden wall is not your average Saturday night, but at Bad Axe Throwing Edmonton, they are the main ingredients for pure fun. There’s nothing quite like the feeling of the axe handle leaving your hands and flying through the air, hitting the target with a sharp thud and we know the residents of Edmonton agree with us. What do we love about this great city? Everything. In just over a year since we opened, Edmonton has welcomed us with open arms and we’re extremely thankful. It’s a city with a wicked hockey team and a really cool new arena–Rogers Place–which only goes to show we know Edmontonians really appreciate authentic Canadian fun. Outside of our favourite sport, axe throwing is a truly Canadian experience that anyone can enjoy, no matter your skill level. It’s open to everyone because we strongly believe the greatest memories are made when every single person enjoys themselves (and that’s hard to accomplish with your typical night out). When we first settled in the city, Edmonton’s entertainment scene had a lot of escape rooms, where people pay to be locked in a room and figure out how to get out. Is that an experience that sounds thrilling? To us, it sounds like the summary of a bad horror film and it seems so…boring. We’re not into confusing people with frustrating puzzles or weird tasks, nor confining them to small spaces. At Bad Axe Throwing, we encourage people to meet new friends and enjoy pure, unrestricted fun. 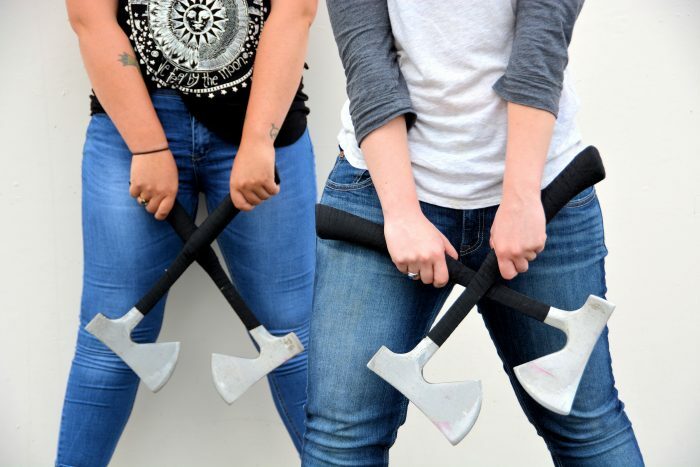 Axe throwing is part mental energy, part physical energy and mostly limitless positive energy. It’s why Edmontonians keep coming back to us–the experience is never ending! From your first throw, you’re hooked. As you wind up with a firm grip on the axe over your head and take aim at the target, it’s a rush like no other. 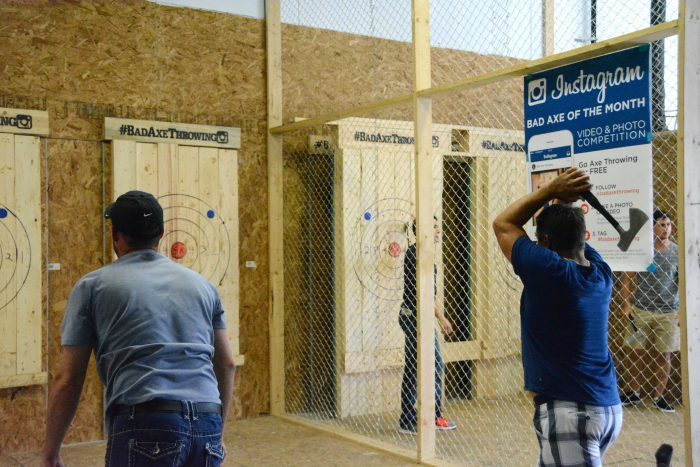 Luckily, Bad Axe Throwing offers more than one way to get your fix in Edmonton. Whether you’re looking for one of the top rated activities in the city, celebrating an important occasion like a birthday or bachelor/bachelorette party or want to take your axe throwing skills to the next level, we have it all. For those seeking the thrill of throwing blades on the regular, Bad Axe Throwing has an axe throwing league in Edmonton where you can really sharpen your technique and compete for the ultimate championship title. And in a city of champions, it only seems fitting that we’d help develop so many axe throwing champions. We couldn’t ask for a better city to share the great sport of axe throwing with. Thousands of Edmonton’s finest folk have walked through our doors and we can honestly say that every time, left with huge smiles, hilarious photos and long-lasting memories. There’s a lot of talented axe throwers and those who haven’t yet discovered just how talented they are. Thanks, Edmonton for an epic year. 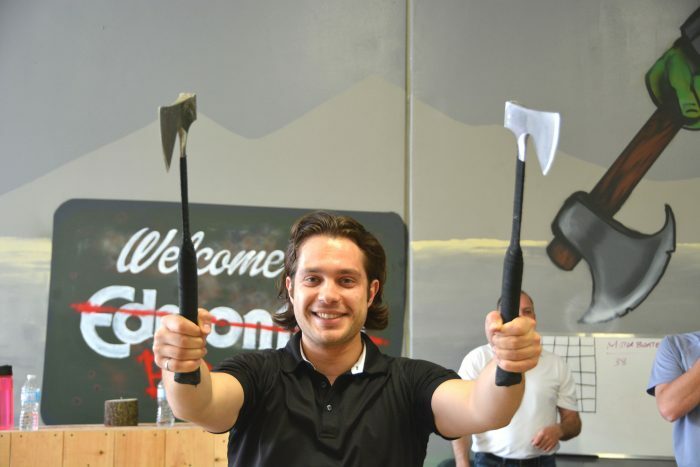 We can’t wait to see how many more champions will get their axe throwing on!